What Happened To The Aid Meant To Rebuild Haiti? 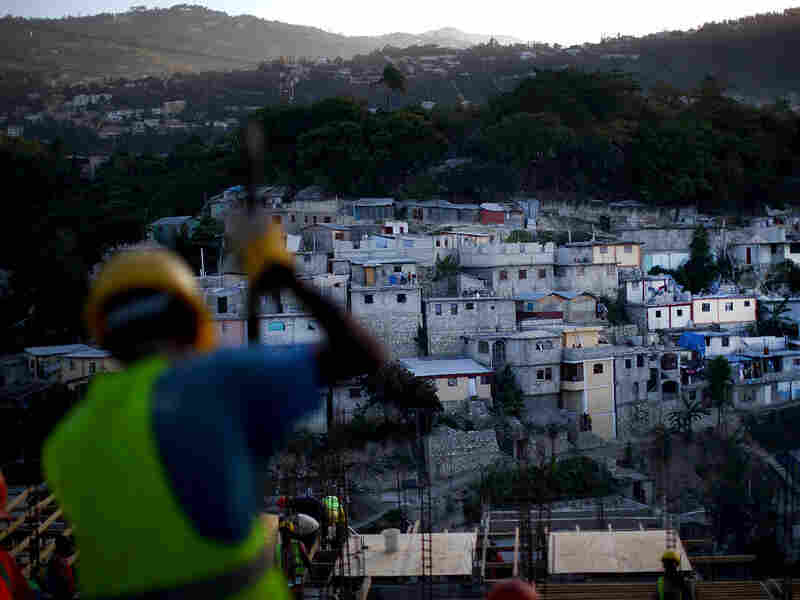 : Shots - Health News Three years after an earthquake destroyed much of Haiti's capital, it's clear that only a fraction of the $9 billion pledged in international relief reached the country. Most of what did arrive went to short-term relief, instead of rebuilding people's homes. Many homes that were rebuilt after the earthquake in 2010 are even more dangerous than the original ones. This three-story home was put up after the quake but is already slated for demolition to make way for an 18-unit housing project. After a devastating earthquake hit Haiti in 2010, governments and foundations from around the world pledged more than $9 billion to help get the country back on its feet. Only a fraction of the money ever made it. And Haiti's President Michel Martelly says the funds aren't "showing results." Roughly 350,000 people still live in camps. Many others simply moved back to the same shoddily built structures that proved so deadly during the disaster. Martelly says the relief effort is uncoordinated and projects hatched from good intentions have undermined his government. "We don't just want the money to come to Haiti. Stop sending money," he tells Shots. "Let's fix it," he says, referring to the international relief system. "Let's fix it." 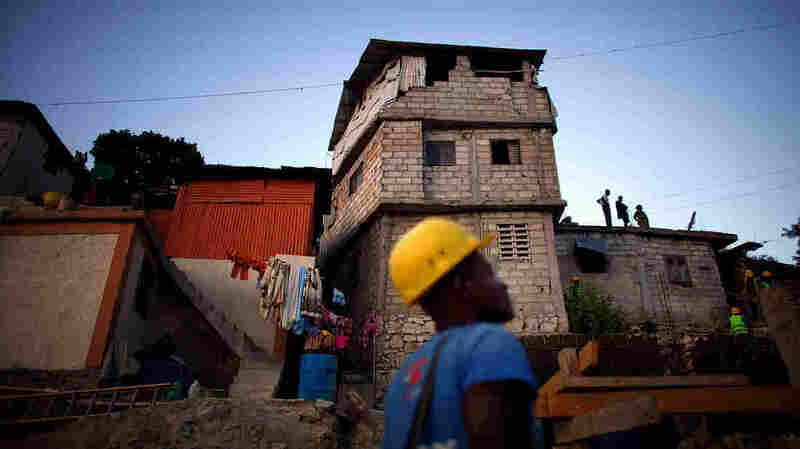 Although progress has been slow, there are signs of construction in Haiti. A neighborhood near downtown Port-au-Prince that was in shambles after the quake has been rebuilt. Disaster specialist Dr. Tom Kirsch from Johns Hopkins School of Medicine agrees with Martelly. "Clearly we saved lives," he says. "Clearly we put people in tents. Clearly we did all kinds of stuff. But at the same time the level of chaos and the overall ability to reach needy people, we don't know how well we did." Kirsch, who's been in Haiti several times since the quake, added, "We could have written a check to everyone in Haiti for — I don't know — $10,000 a piece, which would support them forever rather than the way we spent it." So where did all that money go? We got to put that question to reporter Jonathan Katz, author of the new book The Big Truck That Went By: How the World Came to Save Haiti and Left Behind a Disaster. He was Haiti bureau chief for The Associated Press at the time of the quake. Here are highlights from the conversation, edited lightly for length and clarity. Shots: Aid pledged to Haiti — $9.3 billion worth from 2010 to 2012 — is about a third of all global health aid donated in 2012. What happened to the money that was supposed to go to Haiti? Katz: Money did what money tends to do in most foreign aid situations. That is, rather than being a model in which a rich country gives a poor country a big bag of cash and says, "Here spend this on fixing things up from whatever the latest crisis was," what actually happens is that very little of the money actually leaves the donor countries. First of all, you've got billions of dollars that are promised but just never delivered. You've got billions of dollars more that were sort of creative accounting. Donor nations say they're providing debt relief, yet those debts were never realistically going to be paid back. So some of the money is sort of fictive. So how much actually made it into Haiti? Even among the real money, if you look at what was labeled as humanitarian relief, in the months right after the quake, that amounts to about $2.5 billion. Ninety-three percent of that money either went to United Nations agencies or international nongovernmental organizations, or it never left the donor government. So you had the Pentagon writing bills to the State Department to get reimbursed for having sent troops down to respond to the disaster. If we're talking about reconstruction, it's really a misnomer to think that relief aid was necessarily going to have the effect of rebuilding a country in any shape or form. So what was that money spent on? Band-Aids. Literally bandages. Short-term relief. Tarps to put over your head. Food to fill emergency gaps in supply. But food gets eaten. Tarps wear out. Band-Aids get pulled off. And ultimately, all that money is spent, but people aren't left with anything durable. When you hear about all these billions of dollars [in aid donations], the imagination is that they're going to go and rebuild the country after the earthquake. They were never intended to do so and, lo and behold, they didn't. There are often complaints after big disasters about waste and inefficiencies. Was the Haiti earthquake different from any other international disaster or is this typical? What is interesting about Haiti is the extremes. There are lots of places that have weak governments, but Haiti's government is weak in a special way. It's the product of so many years of aid going around the government and international efforts to undermine the government. Presidents being overthrown and flown out on U.S. Air Force planes and then reinstalled and then overthrown again. That left the Haitian government in such a weakened state. Then the disaster itself was also so much more extreme. It was so concentrated. It hit the capital city. Whether your estimates for a death toll is in the 80,000 range or closer to the government's estimate of 316,000 — in a city of 2.5 million people — it's just an extraordinary number. It was an incredibly horrific disaster. It hit the country right at its heart and destroyed a government that was already weakened. But beyond that, the attitude that so many foreign aid groups have regarding Haiti is that you can basically come in and do whatever you want. So there was no accountability, no coordination. People were just running around doing what they thought was best or what they thought was best for them. And it really created a mess.